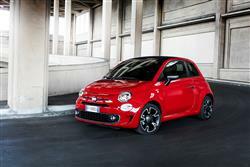 Fiat's little 500 gets a sportier look and some desirable interior options in plush, more dynamic-looking 500S guise. Jonathan Crouch looks at what's on offer. Let's see if this is you. You'd like a Fiat 500 but you want one that looks a bit sporty. You don't want to stretch to the high prices and high running costs of the Abarth models, partly because you don't necessarily need that level of performance. You like your creature comforts - and you appreciate cutting-edge technology. If I've just described you, then here's your car, the 500S. It's hard to imagine quite where Fiat would be today if it wasn't for the modern era 500 model. This design accounts for a rather frighteningly high proportion of the brand's total sales and has spawned a whole series of larger models including the 500L, the 500 MPW and the 500X Crossover. It's the classic 500 citycar that buyers still seem to love most though. If you're among them and would like the standard package supplied with a sportier look and feel, then this 500S model could be for you. The 'S' package of changes is essentially a visual rather than a dynamic one, so under the skin, it's exactly as you'll find with other 500 models. The engine that most suits this car is the 105bhp 0.9-litre petrol TwinAir two cylinder unit. This makes 62mph in 10.0s en route to 117mph, which is about as fast as you'd really want to go in a Fiat 500. Yes, this powerplant can get a bit vocal if you work it hard. Even then though, the gruff, slightly throbby note is characterful rather than unpleasant and around town, refinement is more than acceptable. If you are urban-bound, you might also want to consider the optional (but rather jerky) Dualogic gearbox, a kind of manual transmission without a clutch. Unless you like all that left-foot pumping of course. City dwellers will also appreciate the tight 9.3m turning circle. Compared to the standard model, the 500S is equipped with sports bumpers, special side skirts and a rear spoiler, while the door handles, tailgate, front grille, mirror fairings and 15-inch alloy wheels are trimmed with a special 'Satin Graphite' finish. Inside, the 500S gets black seats and a black roof lining which contrast with the door panels and seat edges, which are finished in blue, white or yellow. 'Satin Graphite' detailing also features on the dashboard fascia and the special sports steering wheel. A full-colour TFT instrument display with reconfigurable settings is standard. The dashboard incorporates FIAT's Uconnect 7-inch HD LIVE touchscreen with tablet-like controls and a high resolution display. This system offers a wide range of functions, including Uconnect LIVE services, a Bluetooth hands-free system, voice recognition and a multitude of music playback options, including Bluetooth streaming, USB connection, a 3.5mm auxiliary jack, DAB digital and an FM/AM radio. As usual, there's a single three-door bodystyle, though you can order it in soft-topped '500C' form if you like the idea of having an electric fabric-folding roof. The 185-litre boot remains as compact as ever, though it's still big enough to trump many rivals. This of course will number amongst the pricier fashion-led tiny citycars but at least you get plenty of equipment as part of the deal and, as with every Fiat 500, there's plenty of scope to put a personalised touch on the finished product. 500S buyers might want, for example, to look at a set of classy16-inch wheels with a matt diamond black treatment. And rear privacy glass, a chrome-finish exhaust tailpipe, a bold rear grille and two specific body colours, 'Electronica Blue' and a smart matt Green, complete the list of optional exterior features. Inside, the interior can also be trimmed in optional Frau leather with white or light blue details for a splash of additional luxury. Plus you can make more of the Uconnect HD LIVE touchscreen by equipping it with Apple CarPlay and Android Auto functionality so that you can mirror the workings of your smartphone onto the dashboard monitor. The system can be specified with the latest 3D TomTom navigation system as well. The exclusive BeatsAudio sound system also debuts on this 500 model. Developed in conjunction with Beats by Dr. Dre, the seven-speaker system has a total output of 440 watts and features a digital amplifier integrating an advanced equalisation algorithm, which can recreate the entire sound spectrum that an artist experiences during studio recording. One of the advantages of such a small car is that tiny fuel efficient engines are more than adequate for hauling you and your little Fiat around. The economy champion for petrol buyers is the 85PS TwinAir petrol variant, a car capable of 74.3mpg and 90g/km of CO2 (or 2g/km less if you opt for the Dualogic 'box). Even the quickest 105PS TwinAir model manages 67.3mpg and emissions of 99g/km. If you decide to go for the open-topped 500C variant with any of these engines, you'll see no penalty for either economy or emissions. What else? Well, this car should certainly be cheap to insure. For the TwinAir 85bhp variant, you'll be rated at between groups 10 and 13 and for the TwinAir 105bhp version, you'll be rated at group 15. The warranty is a typical three year affair but with a 100,000 mile limit that's significantly higher than some other brands will give you. 500 models hold their value very well and that's unlikely to change any time soon. Don't be tempted to go customisation-crazy with the options list though: not everyone will share your taste or want to pay extra for graphics when it comes time to sell. To be honest, it's surprising that Fiat didn't introduce a variant like this 500S before. The model line-up for the 500 is full of fashion-led variants but until the arrival of this derivative, buyers who wanted the car supplied with a sportier demeanour had to find the substantial amount necessary to graduate up to one of the Abarth hot hatch variants. The availability of the 500S plugs that gap in the range and presents us with a variant of this car with a slightly more masculine, dynamic air. We think it'll sell well.